The grim world of Hajime Isayama’s Attack on Titan manga has evolved into a multimedia franchise as gigantic as its titular titan behemoths, with movies, spinoffs, and a popular anime series. But now the series is doing something a little different: an English-language novel for young adults, and Gizmodo has a sneak peek. 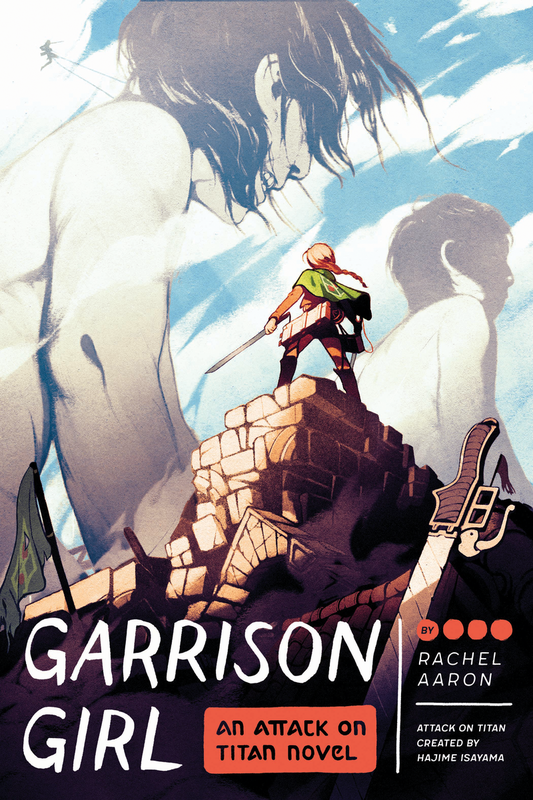 Written by Rachel Aaron and published by Quirk Books, Garrison Girl follows an all-new cast of characters rather than Eren and his comrades from the main Attack on Titan story. Set five years after the massive Titans returned to threaten the last vestiges of humanity once more, Garrison Girl introduces Attack on Titan fans to Rosalie DuMarque, the daughter of one of the few noble families left cooped up in humanity’s multi-walled city. She defies her father’s wishes and signs up to join the Garrison, the largest of the military forces tasked with protecting the city’s walls from the Titan threat. But instead of simply getting a chance to go beyond the walls that have surrounded her entire life, Rosalie finds herself thrust into more problems than just the giant, human-consuming monsters on her doorstep, whether it’s earning the trust of her fellow comrades in arms, dealing with the corruption rooted within the city’s ruling classes, or...well, you know, the giant, human-consuming monsters. That’s not the only problem, but it’s probably the biggest! Without further ado, here’s a hefty snippet of Garrison Girl, introducing us to Rose’s plight. On a clear day, from the top of her house, Rosalie Dumarque could see all that was left of the human world. Standing on the peaked roof of the colossal Dumarque Manor, which was itself perched atop one of the tallest hills in the district, she could look right over the fifty-meter-high circle of Wall Sina into the terrain beyond. This early in the morning, the towns and fields of the Rose Zone were still hazy with the autumn fog, but if she squinted, Rosalie could just make out the white ribbon of Wall Rose running along the horizon, 130 kilometers away. The sight never failed to make her stomach tighten. More than a marvel of engineering, Wall Rose was a boundary. The fifty-meter- tall circle of stone marked the edge of human civilization, the end of the world. It hadn’t always been this way. For most other childhood, the end of the world had been at Wall Maria, nearly twice as far away. Growing up, Rosalie had considered the walls a default component of reality, like the sky or the ground. They were always there, the unbreakable barrier that shielded everything she knew from the monsters that stalked the wilderness beyond. Then, five years ago, the monsters had broken through. In a single day, the land left to humanity was diminished by a third. With Wall Maria broken, all territory between it and Wall Rose—all the cities and farms and forests in the Maria Zone—was now the domain of titans, not humans. Rosalie’s personal world was even smaller. She’d never been allowed outside Wall Sina, the heavily fortified inner ring that protected the king and all the noble families. She failed to see much difference; big or small, a prison was a prison. So long as titans existed, the world would always be walled in. And humans were no better than cattle in a pen, patiently waiting for the day the wolves broke through to finish them off. As always, that bitter realization ruined the view. Clenching her fists, Rosalie pushed off the chimney she’d been leaning against and started down the steep roof. A few of the clay tiles shifted under her feet, reminding her sharply of the long fall to the ground below, but Rosalie wasn’t afraid. She’d never been as graceful as her elegant older sisters, but her time in the Royal Military Academy had toned her muscles, honed her sense of balance, and erased any fear of heights. Also, she’d been climbing up here since she was tall enough to push open her bedroom window. She knew every wobbly tile by heart. When she reached the edge of the slanted tiles, Rosalie lowered herself to sit back on her heels. Down below, her family’s estate—extravagant even by noble standards—spread out like a perfect green carpet all the way to the base of Wall Sina. The army of groundskeepers was already hard at work pruning fruit trees, weeding flower beds, bringing in sheep to crop the grass, and all the other essentials necessary to keep the massive estate looking well kept. She knew exactly how many essentials there were. Her mother had drilled her on proper land management for years, in preparation for the day when Rosalie would be lady of her own house. Soon, she’d be the one whose world revolved around making sure all the tedious little details of keeping up appearances were taken care of. Rosalie rose back to her feet. A wind blew up from the south as she stood, blowing a wisp of her blonde hair loose from its braid and into her face. Rosalie tucked the strand behind her ear impatiently as she turned to stare at Wall Rose again, its curved white line gleaming back at her like a mocking grin. Rosalie grabbed the lip of the roof and lowered herself to her bedroom window to do what she’d come home to do. Even with a maid to help fix her hair and lace her into the Roy- al Military Academy’s fifteen-part dress uniform—sans swords, sheaths, spare blades, and vertical maneuvering gear—it still took Rosalie a good twenty minutes to dress. It took ten more to make her way down the stairs from the family wing, across the rose gar- den, through the grand ballroom, and up the stairs again to the thick carpeted hallway outside her father’s office. She knocked and stood at attention, holding herself as straight as possible while the ancient butler opened the door. As always, the old man gave Rosalie a sour look before shuffling sideways to reveal her father sitting at his desk. Unlike Rosalie with her too-young face and highly unladylike habit of fidgeting, Charles Dumarque carried himself as every inch the noble lord he’d been bred to be. Even eating breakfast in his office at six in the morning, Lord Dumarque was impeccably dressed in the full officer’s uniform of the Military Police. Every fold was pressed to a perfect crease, every medal on his chest polished to a mirror gleam. Even his hair—thinning now, but still the same golden color as Rosalie’s—lay in rigid order, the short-clipped strands not daring to stir when he lifted his head to glare at his youngest daughter. “I was wondering when you’d come,” he said, reaching to turn down the oil lamp that was flickering on the shadowed side of his writing desk. Rosalie took that as evidence he’d started working before the sun rose. Her father didn’t sleep through the night very often anymore. Not since the fall of Maria. By the time he finished, Rosalie was imagining throwing his fancy teacup in his face. She clamped down on the urge at once. She’d spent the last week crafting a strategy for this conversation, one that even her harshest military science instructor would have approved of. But it was all for nothing if she let him make her too angry to use it. Excerpted from Garrison Girl: An Attack on Titan Novel by Rachel Aaron. Reprinted with permission from Quirk Books.